Joseph II of Constantinople, fresco by Benozzo Gozzoli, Cappella dei Magi, Florence. Born the son of Ivan Shishman of Bulgaria and his wife Sarah in 1360, little is known of his early life before he became a monk on Mount Athos. He became Metropolitan of Ephesus in 1393, before being elected Patriarch of Constantinople on 21 May 1416. Together with Byzantine Emperor John VIII Palaiologos, 23 Metropolitan bishops and countless scholars and theologians, he took part in the Council of Florence. While in Florence, he was quartered in the Palazzo Ferrantini. 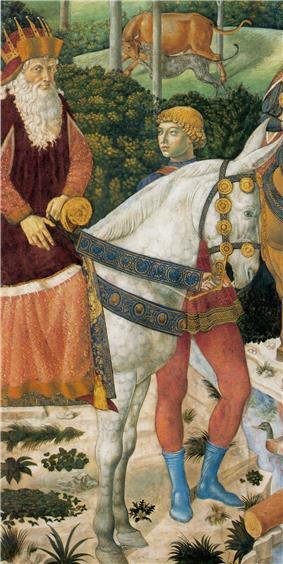 He is portrayed in Benozzo Gozzoli's frescoes in the Magi Chapel of Palazzo Medici Riccardi, which celebrates the entrance of the Byzantine dignitaries in the city.